Downtime is inactive time, as in the time between periods of work. Downtime is all around you but you may not even realize it. Any time you have a few minutes between the end of one task and the beginning of another, you have downtime in which you can be productive. 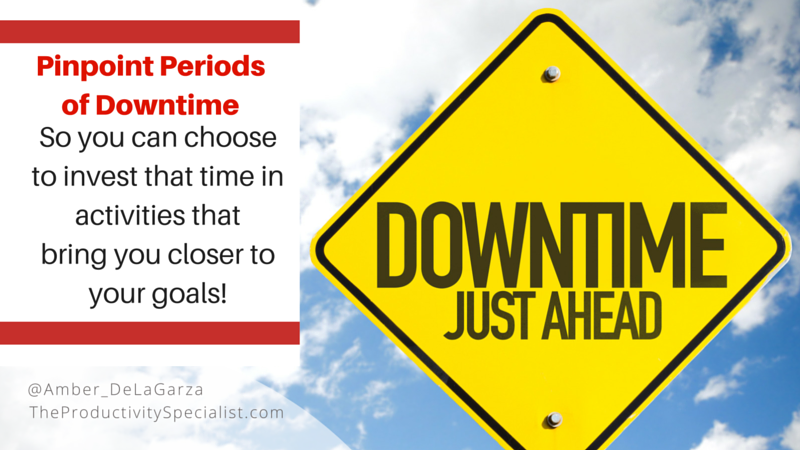 Start pinpointing your periods of downtime and you will have the ability to choose to invest that time differently. 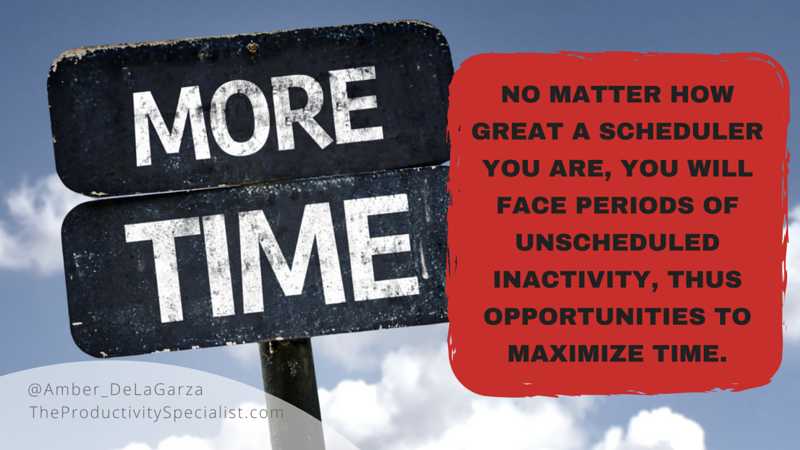 Often, the biggest challenge is recognizing the opportunity to repurpose time because we’re too busy wasting it on habits such as social media, checking (not processing) emails, chit-chatting, surfing the net, day-dreaming, etc. Planning ahead can save you loads of time! 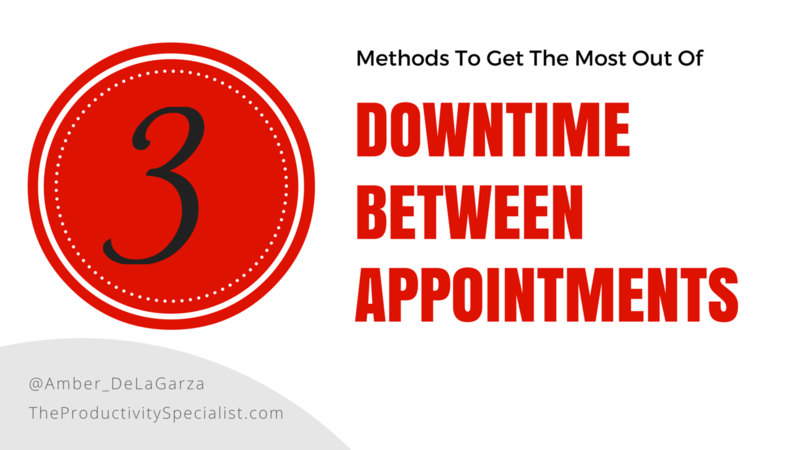 If you are proactive with scheduling your appointments you will dramatically reduce lost time. Schedule meetings strategically so you can maximize time between appointments. Book meetings closely together to avoid long, unproductive breaks. One of my favorite strategies is to schedule meetings back-to-back as a “power meeting day” in a coffee shop. Scheduling back-to-back meetings at the same location minimizes travel time, removes the cost of traveling to another destination, and enables you to accomplish tasks between appointments because you’re stationary. I typically schedule a “power meeting day” once a month with everyone I want to meet with or catch up with if it’s not urgent. This strategy has been very effective and efficient for me and could be for you too! It has two benefits. One, you do not run over on meetings. When you knowingly have another meeting to get to, you will purposefully utilize your blocked time for each meeting more efficiently. Second, back-to-back meetings don’t provide time for long, unproductive breaks. Another strategy is to break up your meetings outside the office into regions. I have several clients who use this planning method and swear by it. They inform their assistants which days they will be in certain areas of town. Their assistants then schedule their meetings accordingly, filling up their calendar with back-to-back meetings by region and date. This strategy works particularly well for professionals that meet at their clients’ homes or offices. Calls – Do you often have to make return calls or progress calls to check in with clients and see how they are doing? Reading – Love perusing trade journals or industry articles for great ideas? Online Research – Need to figure out how to best go about an upcoming project? Let someone go? Upgrade your technology? Review – Have to compile and assess meetings notes? Schedule – Want to capture actions items on your task list? Emails – Need to process emails? Hint: Check your emails only if you have enough time to take action on them. You would have to waste time re-reading them again otherwise. Time does seem to get lost sometimes but unlike missing socks, it can be found – in the seconds and minutes that add up between meetings, appointments, and scheduled tasks that make up our daily lives. Use downtime to your advantage. Recognize it, repurpose it, schedule wisely, and keep a list to maximize time and be productive so you can move forward with accomplishing your goals. Please share your favorite method for maximizing downtime between appointments in the comments below.